I got a little Soccer fever and if you did not, I am here to tell you that the USA lost but can hold their collective heads UP! While the rest of the world calls this game 'football,' we, however, call it 'soccer.' I have no idea what the USA will call it when both games become huge fan favorites. . . . .
Let me say it again, I am not a professional embroiderer (nor do I play one on TV). When I get into a jam, I bring you my results to fix an issue. This time, it is a project that is not lying correctly in a hoop. If you have ordered your Snap-Hoop but it has not yet arrived, this will come in handy. I need one for this machine but it is not yet available. The Snap-Hoop is really great for using when your hands are not as agile as they used to be. You can also realigning all sorts of things. I wrote a blog on that Snap-Hoop telling you some of the advantages of them. They really are State of the Art! I even found a game of angles. It was fun to try my estimating powers. I did rather well and additionally, I got a refresher on what an angle is really made of. I made my protractor out of paper for simplicity. I probably should have put in on a color paper rather than white, but this is fine. I use a wrench to weigh it down becaise it is heavy and does not interfer with the protractor. 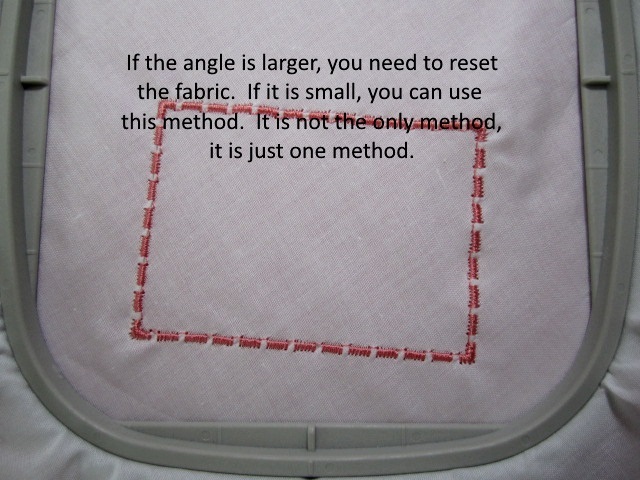 I did this example with scrap fabric and suggest you do so as well before you need to use angles on an expensive project. Be prepared! 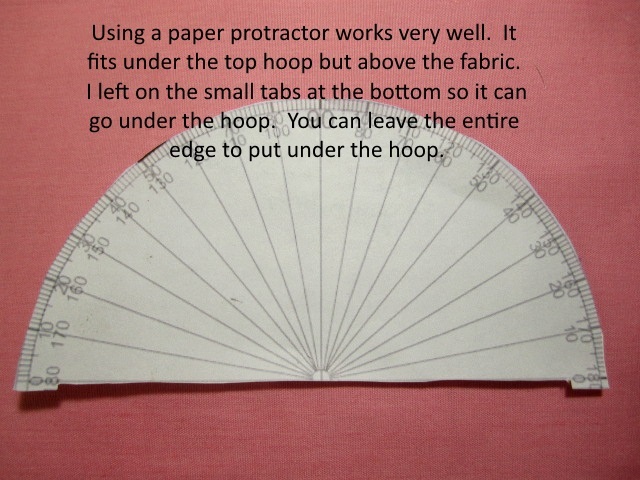 Next, take your paper protractor and place it on a the side of your hoop. What you are looking for is to determine the number of degrees that your project is out of alignment. Keep the edge of the protractor on the straight edge of the hoop. 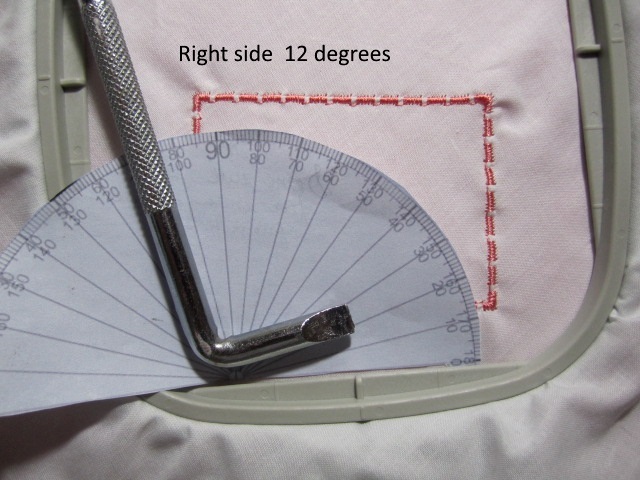 The right side shows that the square is 12 degrees from the bottom of the hoop. If it is hard to see, you will have to trust me on this one. 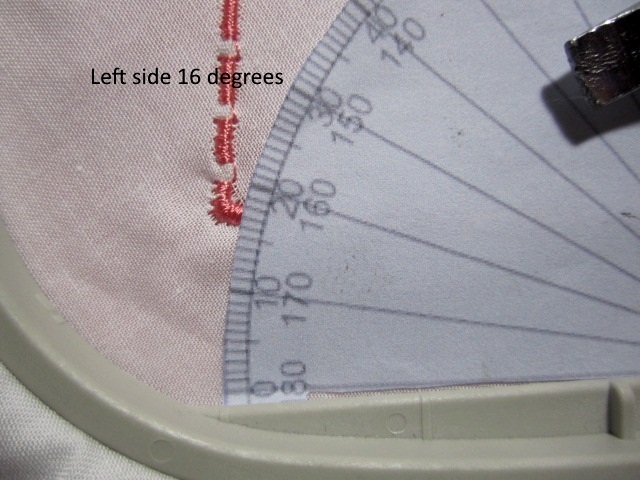 The left side shows 16 degrees, therefore, you will want to adjust your sewing area by reducing the left side; change the rotation by 4 degrees in a counter clockwise direction. Again, keep in mind that your project may not be able to move 4 degrees because the tolerance between the length and width of the design may be too close to the length and width of the hoop. In that case, you simply must reset the fabric. I felt very happy with this one because in the past, I have been guessing at the amount of change needed and not very well either. If you use a different method, please give us a little note in the comments section. If you need to use photos, put your information in the Forum and use the comments area here to place the link. I want to hear from YOU! We all love to hear tips and tricks, show off just a little right here. 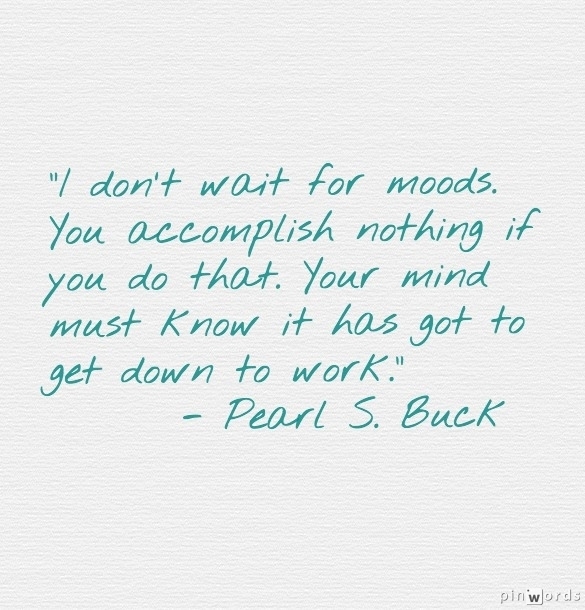 This quote was written just for ME! Follow Your Heart Monogram of the Month: A Reason to Celebrate!